KeepSolid VPN offers a reliable and fairly easy way to access your favorite streaming services at home or abroad. In late November, KeepSolid rolled out VPN Unlimited 5.0 for Mac and Windows. 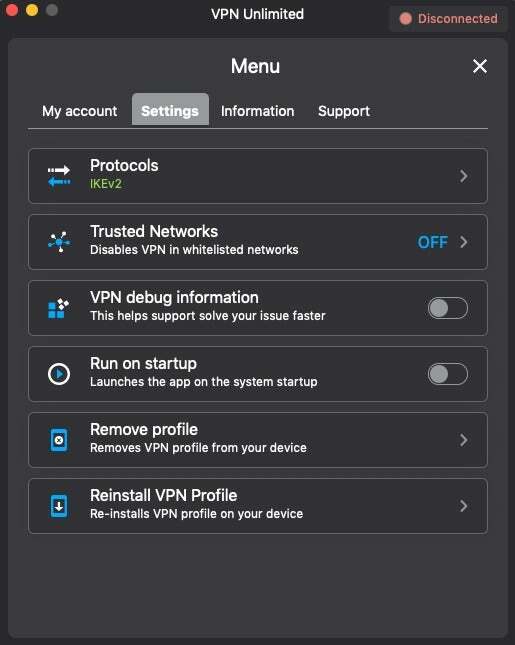 Where the previous version of VPN Unlimited was a mess of options and information overload, VPN Unlimited 5.0 is more streamlined to help you get online faster. Overall, KeepSolid is a pretty good service with reliable but not blazing fast speeds. It’s also a good platform for accessing streaming services like Netflix, whether you’re overseas or just securing your connection at an airport. The company offers more than 400 servers in 51 countries. When you first open VPN Unlimited, you’re greeted with a single window. The background is a map of the world showing your current location at the city level, as well as your IP address. The bottom of the window displays a large Start/Stop button and a location selector. 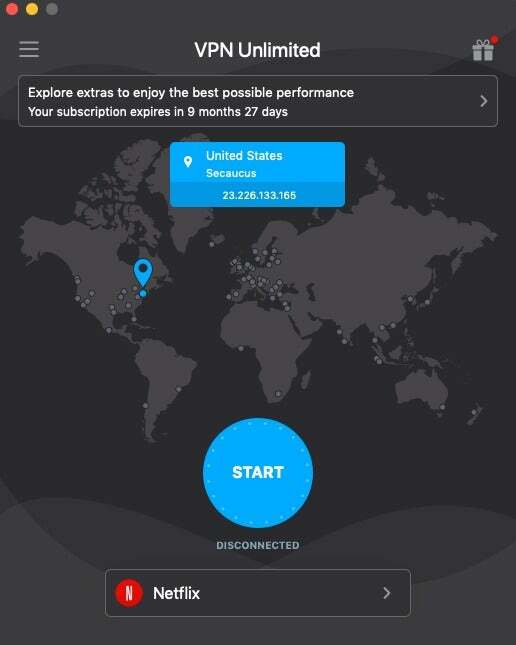 Choose a new location and VPN Unlimited automatically connects. If you’re just choosing the same location you used previously, click Start to connect. 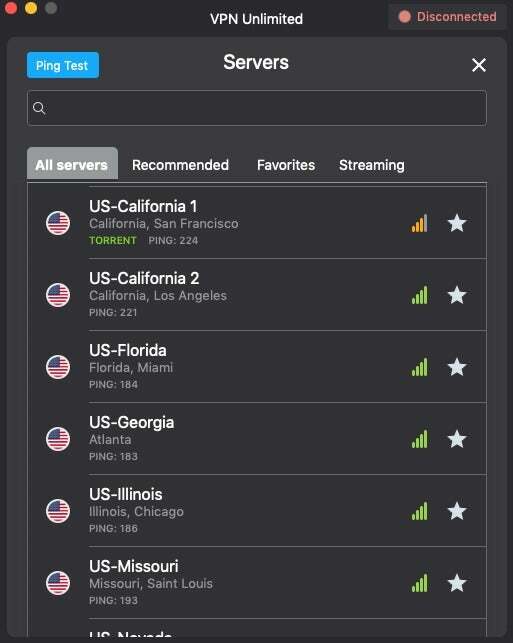 By default, VPN Unlimited suggests the best server based on your location, which it dubs Optimal. If you want a different server, click on the location selector and a panel pops up with all the various server choices. KeepSolid’s server listings after a ping test. This panel has four tabs that organize servers into categories including All servers, Recommended, Favorites, and Streaming. 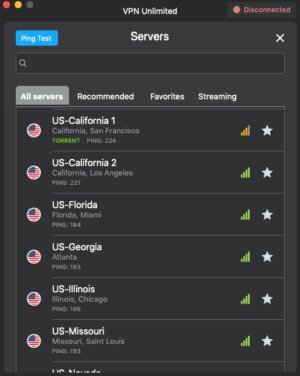 It’s very helpful to have VPN services organize their servers like this, especially ones such as KeepSolid that help you get around regional restrictions or past anti-VPN detection for video streaming. I didn’t test all of KeepSolid’s various streaming claims, which include Hulu, Netflix, ESPN+, HBO Now, and BBC iPlayer. To be honest, most of these services are fairly easy to get around on any VPN with the exception of Hulu and Netflix. But, as promised, KeepSolid did an admirable job of accessing both. Favorites pulls from servers you’ve clicked with a star. Recommended offers a list of the best servers for you to use based on your location. And All servers is self-explanatory. When scrolling through each server list, KeepSolid displays a set of bars similar to what you see for cell phone reception to indicate how well that server should perform. Four full green bars suggests the server should be optimal, while fewer or yellow bars suggests it’s less than ideal. You can also test every server by clicking Ping Test in the upper left corner of the server panel. Once the ping test is complete, you’ll see how many milliseconds each location takes to get back to you. In general, the smaller number the better, though a nearby server location that is already under heavy load may perform poorly. Back on the main screen, the hamburger menu in the upper left corner opens the settings panel where you can do various things such as view your account, or see how much time you have left on your account. The meat of this section, however, is under the Settings tab. In this section you can choose the protocol you’d like to use for connecting. By default on Mac, VPN Unlimited uses IKEv2, but you can also choose OpenVPN, UDP, or TCP. Each protocol option explains what you can expect to experience when you choose it. The Settings tab also has an option to set trusted networks such as your home or work. 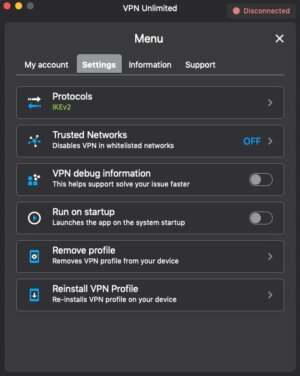 When a network is set as trusted, the VPN will turn itself off if it’s active. That’s not a relevant setting for an iMac, Mac Pro, or even a MacBook for that matter, as VPN Unlimited doesn’t automatically connect on those devices. That’s about all there is to the app itself. Overall, the app is very easy to use and understand. Navigation is simple enough for novices, and for power users there are a few options such as protocol and server selection. VPN Unlimited’s performance came to about 35 percent of my base speed based on performance in five locations (USA, UK, Germany, Australia, Japan). That’s pretty good and about average for VPNs, though not the fastest we’ve seen. Keep in mind that VPN speeds can vary greatly based on a variety of factors such as your location, devices, router, and Internet service provider. VPN Unlimited offers two pricing tiers. The first allows for five devices to use the service simultaneously (apps exist for Windows, Mac, Android, and iOS). An entire year at five devices will set you back $60 or $10 on a month-to-month basis. There’s also a three-year option where you pay $100 upfront, but at the time of this writing, you're better off with buying KeepSolid's deal of $80 for a lifetime membership if you want that long of a subscription term. If you choose to go for 10 devices, then the annual prices goes up to $90, the month-to-month cost is $15, and three years will cost you $150. Again, there’s currently a lifetime subscription for a better rate than the three-year membership; it'll set you back $120. KeepSolid’s service is pretty good. Its speeds are serviceable and should work well under most circumstances, but our testing shows there are faster VPNs available. The company is fairly forthcoming about who’s running the show (we look for full transparency in VPN services), and the app is pretty great. I would, however, like to see KeepSolid add the ability to choose specific servers. There are certainly ways to do that without adding too much complexity to the interface—NordVPN is a great example of this. I wouldn’t recommend VPN Unlimited for anyone looking for maximal privacy and anonymity, but for average day-to-day use, it’s a good choice.